Are you here because of our newest mail-out? 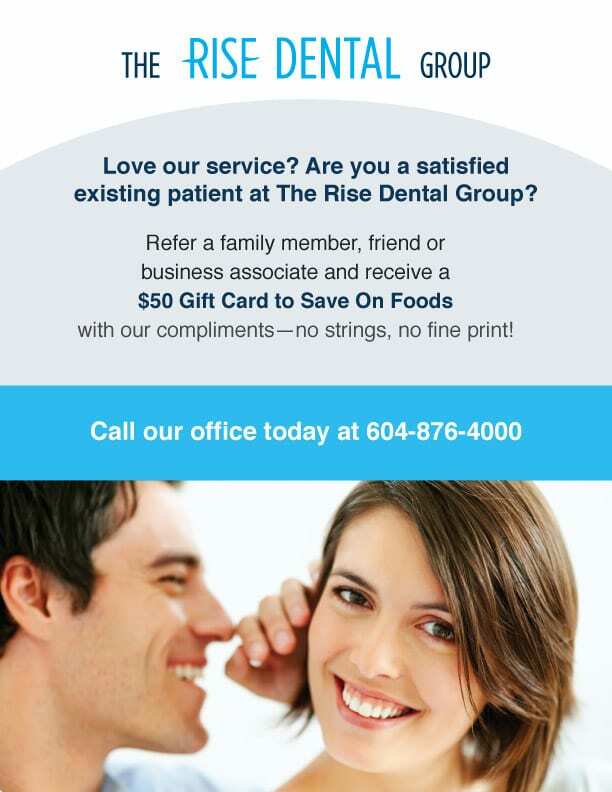 The expert dental professionals at The Rise Dental are passionate about providing Vancouver residents with world-class dental solutions. Our mission is to provide the highest level of patient care with state of the art dental technology, techniques and treatment options. At The Rise Dental clinic in Vancouver, we offer a wide range of dental services and always look forward to maintaining your stunning smile. We are your one-stop shop for dental service, offering cosmetic, restorative, and general dentistry. Nervous about visiting the dentist? We can help put your mind at ease with a variety of options, including oral sedation. We work hard to make each appointment comfortable, ensuring that you remain relaxed throughout the entire procedure. Conveniently located near multiple Vancouver Skytrain stations and the Canada Line, our dental clinic is easily accessible for patients in the Cambie and City Centre community. We are now accepting new patients at our state-of-the-art Vancouver dentist practice, book an appointment today to experience world-class dentistry in your own backyard! 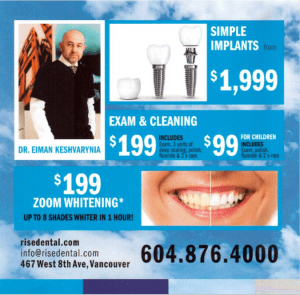 To learn more about The Rise Dental Clinic in Vancouver, please contact us today or visit us at 467 West 8th Avenue.